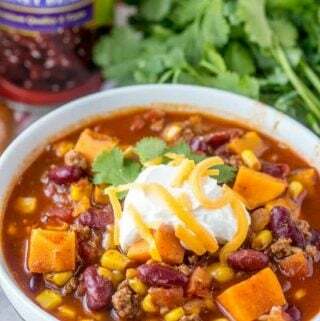 This Sweet Potato Chili is quick, easy and delicious. Full of wholesome goodness this is a family hit that keeps your belly full! In large stock pot cook your turkey until browned. Add in onion and garlic and cook until onion is translucent. Add in tomatoes, sweet potatoes, chicken broth, kidney beans, corn and spices and bring to a boil. Reduce heat, cover and simmer for about 25-30 minutes until sweet potatoes are tender. Serve with sour cream, cheese and cilantro if desired.